The gateway to all of Kauai wonders, Lihue is where you'll likely arrive first, via plane or cruise ship. It's your introduction to the beauty of Kauai - and what a welcome it is. Lihue is the county seat and it offers much in the way of culture -- Hawaiian music and hula performances and other fun heritage festivals. The Kauai Museum plays a role in showcasing art and island history. Grove Farm Homestead, the former home of George N. Wilcox and his descendents, is today a museum that provides visitors with a look at how plantation owners and workers lived more than a century ago. The Grove Farm was one of the most successful sugar plantations and Kilohana, Gaylord Wilcox's former home, houses distinctive shops and an open-air restaurant. Adjacent Kalapaki and Nawiliwili highlights include the Alekoko (Menehune) Fishpond, Kukui Grove Shopping Center, and Kalapaki Beach. The Alekoko Fishpond lies along Huleia Stream. Located on the southwest side of Kauai not far from Poipu Beach, Kalaheo is a quaint little town with a main street much like the western frontier towns of the 1800s. 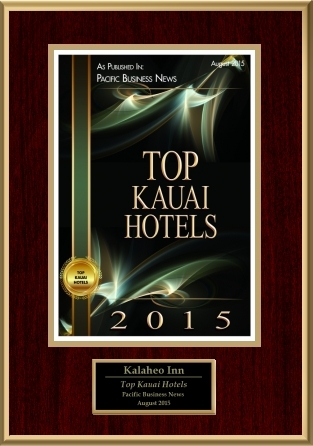 Our Kalaheo Inn is centrally located so you can walk from your suite to several restaurants with palate-pleasing cuisines, including the Kalaheo Steak & Ribs; and just opposite the Kalaheo Community Center is Kaua'i Kookie Cafe & Market. A block or two down the road is Brick Oven Pizza, arguably the best on the island! Just across the way is a good Chinese "take-out" restaurant called No. 1 Chinese BBQ Restaurant and Pizza Hut. You’ll also find some of the best coffee on the island at Kalaheo Café & Coffee Company. Kalaheo Post Office, Aloha Xchng (Clothing Surfe Shop), Kalaheo Yoga, Elements Beauty Salon, and Malie Organics Skincare are all within walking distance. Every Friday night, down in Hanapepe Town there is the Hanapepe Art Night. 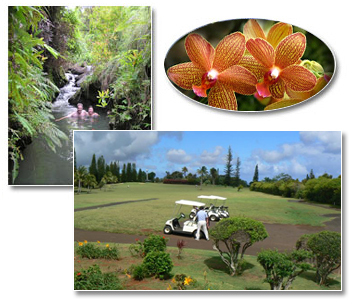 The beautiful beaches and resorts of sunny Poipu are a short 15 minute drive to the South. Salt Pond Beach, to the west, is less known and beautifully quiet. Polihale State Park, home of the largest beach in the state, and Waimea Canyon — the Grand Canyon of the Pacific — are found along the scenic drive to the West side of Kauai. Just a short drive from the Inn will have you putting on one of the plush greens of the 18 hole, Robert Trent Jones Jr. Kiahuna Golf Club & Course. Perched on a hillside in Kalaheo, this nine hole golf course offers sweeping views of Kauai’s south and west shore lines. A true local secret, it was donated to the people of Kauai in the early 1900's by sugar plantation owner Walter McBryde. It is a lovely nine hole course with ocean views. There is a good Café in the Clubhouse. The Lihue Airport is conveniently located approximately 20 minutes away. Click here to view a map with DIRECTIONS. For many more activities in Kalaheo, Lihue, and on the island of Kauai in gerneral, please feel free to have a look at the fantastic website.. 101 THINGS TO DO On KAUAI.